Rapidly evolving telecommunication and information technologies have led to incredible changes in our lives — including how we manage our health. In particular, teledermatology, or the use of communication technology by dermatologists to support the diagnosis, consultation and treatment of patients, has become an important element of health care in the United States and around the world. In fact, it has even been suggested as an effective way to reduce costs and provide otherwise inaccessible expert evaluation. However, the accuracy and viability of using teledermatology is still an area that needs evaluation, especially across diverse practice settings. In an essay that I published previously on Biomedical Odyssey, I described insights that I gained from a course I took in Brazil, where I got the chance to see the application of teledermatology in the context of a non-first world country. While there, I talked to Dr. Tatiana Gabbi at the Faculty of Medicine, University of Sao Paolo (FMUSP), home of the largest hospital complex in Latin America, to learn more about how the FMUSP is integrating telemedicine into dermatological practice. Dr. Tatiana Gabbi and her team recently conducted a study with inpatients who required dermatological evaluation at FMUSP, assessing the correlation between traditional face-to-face evaluation and teledermatology. Data and pictures were collected by medical students using smartphone cameras and then sent to consultants by email, and it was found that total agreement between both consultation types was 54 percent. To me, this indicates that, while a smartphone-based teledermatology inpatient consultation model could be a reasonable option for hospitals lacking dermatological services, further studies would need to be performed to assess if the agreement between modalities would increase if staff more trained than medical students took the photos. As a rising second year medical student, I would definitely be concerned if I found out that my health care depended on a medical student’s ability to take informative and high-quality photos for dermatologist consult! While 54 percent agreement is far from ideal, it is still promising. 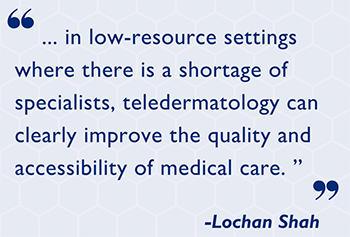 Importantly, in low-resource settings where there is a shortage of specialists, teledermatology can clearly improve the quality and accessibility of medical care. Instead of thinking of teledermatology as something that has the potential to replace dermatologists, I think it is better thought of as a tool to support these dermatologists in their clinical practice, improve patient care coordination and reduce rural-urban health disparities. Yes, patients and providers should certainly exercise caution while using teledermatology, and as this study hints, there are many details that could possibly affect standard of care. It is true that we still have a host of questions left to answer. However, because of telemedicine’s low cost to entry, scientists in countries of varying socioeconomic levels can work together to tackle these questions and share their findings. Intercountry medical education programs, such as the one that allowed me to attend FMUSP this summer, are a step in that direction. Though the course was only two weeks, I feel that the interactions I had with patients, providers, professors and my fellow international students have set the foundation for future international collaborations and dialogue, and will influence my decisions for the rest of my career.